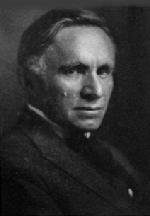 Biography for William Wendt [1865-1946] a California Impressionist artist! William Wendt was born on February 20, 1865 in Bentzen, Germany and died in Laguna Beach, California on December 29, 1946. In 1880, at the age of fifteen, Wendt immigrated to the United States and worked in Chicago as a staff artist where he painted formula pictures. In his free time the young Wendt displayed a love for easel painting and began to develop a personal style of painting. In 1894 and 1896, Wendt traveled and painted with his friend George Gardner Symons visting England and California, and later traveled to the East Coast, Germany and France. He married the sculptress Julia Bracken in 1906, and he and his bride then made the decision to move to California. Traveling to the hard to reach areas of the California countryside for inspiration, Wendt painted canvases graced with trees, rolling hills, blue skies and farmhouses. His earlier works have been termed tranquil and lyrical while his later works evolved to show bold and broad brushstrokes with rich greens and browns. Highly regarded in California and nationally, he earned the title of "the dean of Southern California artists". In 1911, William Wendt became the first president of the California Art Club, and he also held memberships at: the American Federation of Arts, the Chicago Society of Artists, Laguna Beach Art Association, National Academy and the National Arts Club of New York. His works can be found in the following museums: Los Angeles County Museum of Art; Brigham Young University, Museum of Art; San Diego Museum of Art, Smithsonian American Art Museum, Art Institute of Chicago, Dallas Museum of Art, Laguna Art Museum. For Free Evaluations of William Wendt Paintings ~ Please Click Here!